Spring is around the corner, is your roof ready? The snow is melting, temperatures are rising, and coats are starting to seem a little silly to rock. Yep, spring is on its way. While your spring cleaning checklist might include buying new patio furniture, don’t forget one of the most essential and often overlooked sections of your home. Here are 7 tips to help you keep your in roof spring-ready shape. 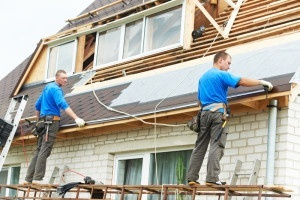 Contact a local roof contractor. Let’s be frank, you don’t know everything you should about roofing, and it’s quite possible that if you may overlook some things if you tackled your roof repair by your lonesome. It’s always best to contact a local roof contractor. Preferably one that is certified, licensed, and bonded. Shingles. Faulty, damaged, or deteriorating shingles can become a hazard during high wind conditions. Normal wear and tear can cause your shingle to curl and bobble, causing shingles to become loose and fly off in an unknown direction. Water damage can also cause your shingles to become loosened and problematic. Attic. Be sure to have your hired roofing specialist check your home’s attic. Heavy snow might have led to roof leakage, water damage, and ice dams. These are all problems that can easily progress with time. The sooner they are apprehended, the better. Roof replacement. Depending on the age of your home you may want to consider getting a portion or your entire roof replaced. This will relieve the stress of living underneath a constant potential hazard. Gutters. Gutters provide proper drainage for storm water and prevent your roof from experiencing roof leaks and water damage when clogged. Making sure your gutters are clean and working efficiently is key to the overall function of your roof. Maintenance. Your roof might not require complete replacement, however there are some minor hiccups you should look for. Loose or missing flashing, unsealed gaps and cracks, and exposed nails are quite common. Remember to point these needs to your roofing contractor, or take a stab at fixing the issues yourself. Walls & Ceilings. A roof with poor ventilation or missing shingle is susceptible leakage, which can cause significant damage to your walls and ceilings and cause paint peeling. Excessive moisture can cause mold and mildew and leave undesirable stains on your interior walls and ceilings. Ready to get to work? Get a free estimate.